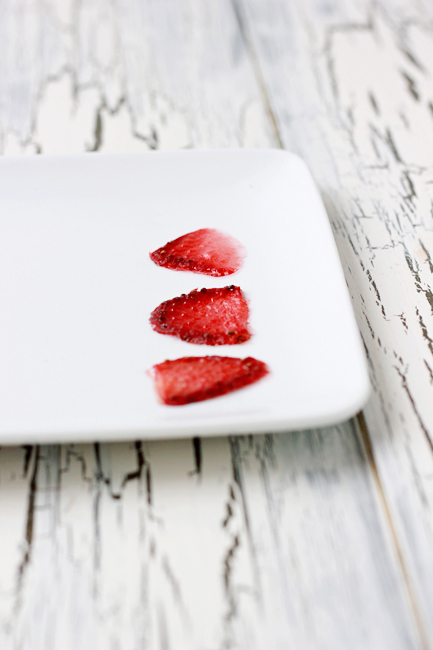 Candied strawberry slices are gorgeous and easy to make. They are the perfect addition to your cupcake and cake recipes! I figured we can start with the basic. What exactly is a candied strawberry? 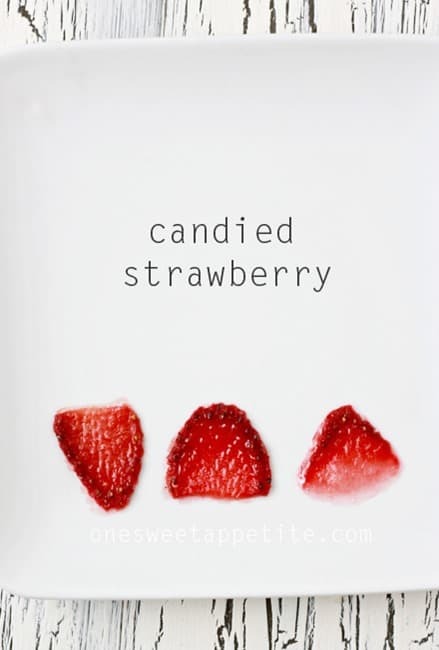 A candied strawberry is a ripe piece of fruit that is covered in a candy coating and used as a fun treat or decoration for you favorite dessert. You can candy strawberries whole or in slices. I decided to candy mine in slices and use as a cupcake topper for my Strawberry Champagne Cupcakes. 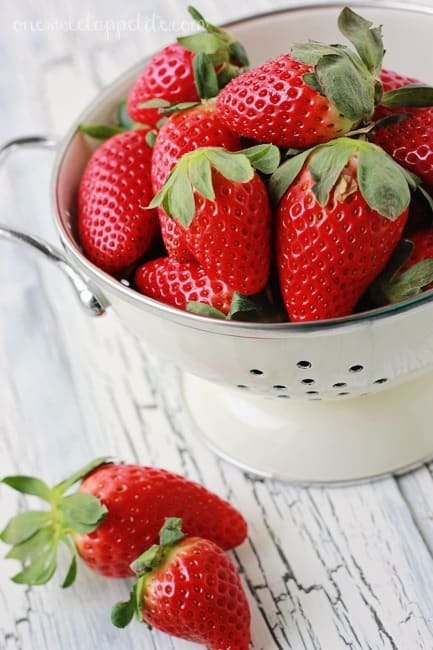 In this post I am going to walk you through, step by step, how to candy strawberries. 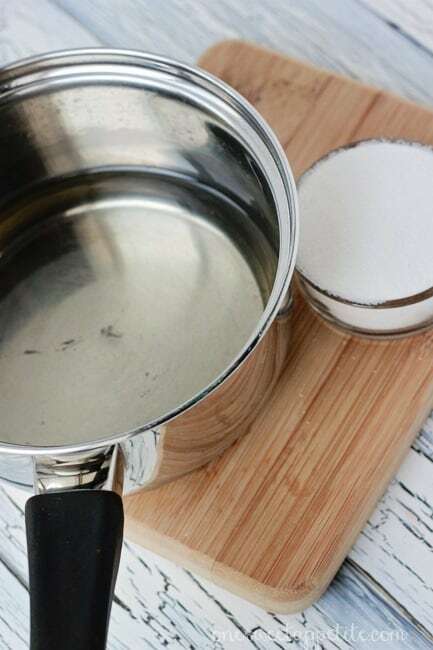 Start by combining half of a cup of sugar with half of a cup of water in a saucepan. Bring to a boil. Make sure you are consistently stirring to avoid any burnt sugar on the bottom of the pan. Once the sugar has dissolved completely, take the pan off of the heat and allow it to cool to room temperature. Now you will want to wash and hull your strawberries. Hulling a berry is a fancy way of saying removing the stem. 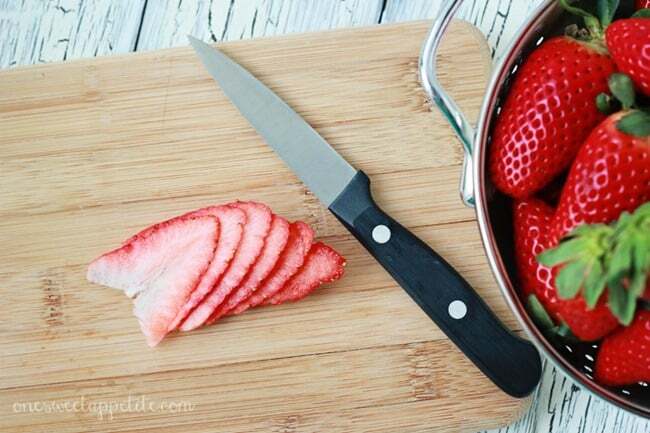 Slice each berry as thin as you can get it. I recommend using a sharp paring knife. Dip into your cooled syrup and place on a parchment lined baking pan. Bake at 200 degrees for up to 3 hours. I recommend checking on your berries every hour to see their progress. You are looking for a dry to the touch berry that still retains the bold red color. The result should be a nice dark red berry that is somewhat dry to the touch, but not overly crunchy. Almost like a gummy version of the fruit. 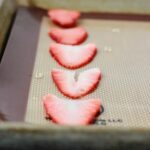 How do you use candied strawberries? 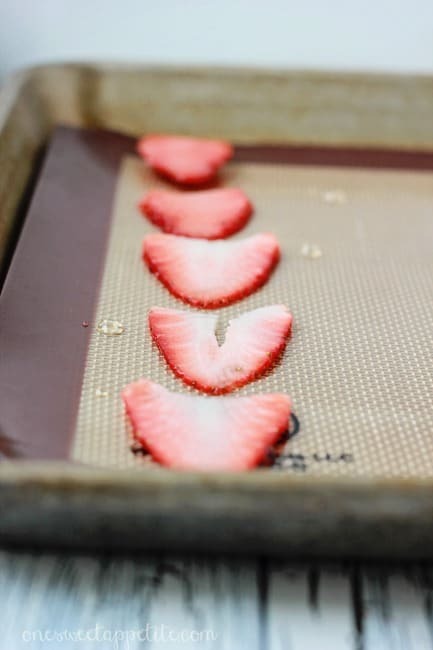 Candied strawberries and candied strawberry slices are ideal for decorating cakes, cupcakes, brownies, or any dessert. They add an elegant touch that really sends your dessert over the top! You could even eat them straight from the tray if you’d like. Combine half of a cup of sugar with half of a cup of water in a saucepan. Bring to a boil. Once the sugar has dissolved completely, take the pan off of the heat and allow it to cool to room temperature. 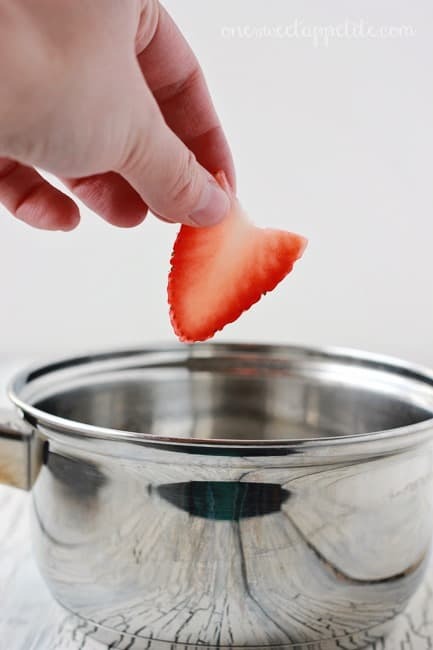 Wash and hull your strawberries. Slice each berry as thin as you can get it. Dip into your cooled syrup and place on a parchment lined baking pan. Bake at 200 degrees for up to 3 hours. I recommend checking on your berries every hour to see their progress. You want them dry, but still red. Ooooh! Well this is fun 🙂 I’ve never heard of candied strawberries. Love the step-by-step. I feel like a stalker.. hope you don’t mind me coming to visit and commenting on every post – just love your site!! stalk away! I love comments! Wow! these look absolutely amazing. I would never have thought to candy strawberries, but now I am craving them. mmm these look delicious! How long do you think they store? Maybe a couple days at most. I would keep them in an air tight container out on the counter. Mmmm! They look delicious. I think my kids would love them too. Pinning! That’s a brilliant idea, definitely saving and pinning! What a fun idea! I can’t wait to see what you do with them! Yum! Can’t wait to make some, I bet my girls would love these! Strawberries are a favorite at our house. This would be a fun new idea for us! Thanks! These look delicious. 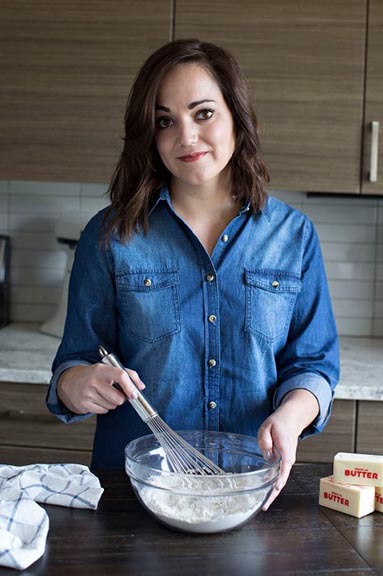 What a perfect valentines day recipe! My husband isn’t a big lover of chocolate so this recipe should certainly do the trick. Yumm! Those look delicious! Thanks for linking them up at Monday Funday! I ove this idea. I play Bunco, once a month with some lady friends and this would be a great snack. I saw some deviled strawberries using Nutella as the filling. I am going to make the candied ones and serve with Nutella on the side as a dip. I loooooove the idea of using nutella as a dip! This looks amazing! Would these same steps work for other berries too, such as raspberries? Thanks! I’ve never tried them with other berries but I would think it would work. Yum! Have you done this with raspberries or any other fruit?